Since it emerged in mid-2014 the water charges movement has grown to become arguably Ireland’s largest-ever social movement. Beginning with small-scale, self-organised resistance to meter installations in Cork and Dublin, the campaign progressed with the formation of Right2Water to a kind of mass politics unseen in Ireland in decades. 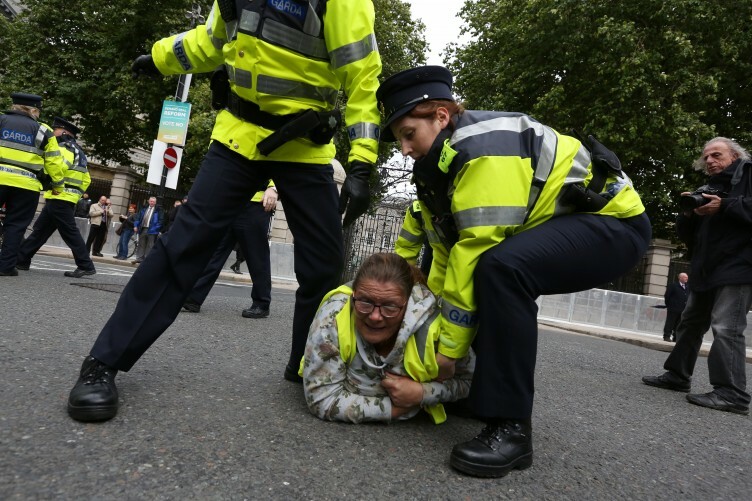 Five protests over 50,000 in Dublin in six months, at times daily events in communities across the island, and a series of scandals that have occupied hours of airtime and pages of newspapers. Through all of this little attention has been paid to one of the most interesting aspects of the movement. While the media focused on the more polished public performers in the trade unions and left-wing political parties, smaller, newer organisations were co-ordinating resistance across the country and growing steadily more influential. As the movement approaches a crossroads with non-payment and the upcoming general election Ronan Burtenshaw explores four of these organisations, asking where they came from and where they are going. 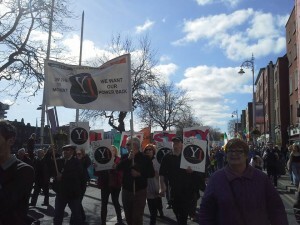 Dublin Says No derives its name from the Ballyhea Says No group in county Cork who have been marching against the bank bailout since March 2011. The ‘Says No’ name has become a motif of the resistance to austerity in Ireland with hundreds of groups around the country adopting it in local campaigns of resistance. 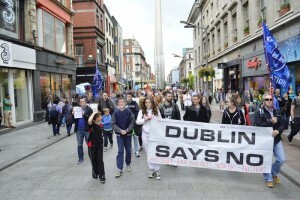 The Dublin version began in February 2013 after a number of activists were unhappy marching behind trade union leaders they saw as “sellouts” in a demonstration against the debt burden. One hundred non-aligned protestors marched in their own demonstration that Easter Sunday, and a march of differing composition and size has been held every Sunday since. Dublin Says No’s strength as a political organisation was built on Facebook, where it has 17,000 likes on a page that regularly sees its images, videos and status updates mocking politicians reaching hundreds of thousands by shares. The page positions the group against “the corrupt political system”, while its banner says it is opposed to “the property tax and austerity”. However it has been in the water charges movement where Dublin Says No has become really significant, organising a January protest without institutional support that drew 50,000 to Dublin’s city centre and pioneered a popular tactic of marching from numerous points and converging on O’Connell Street. These confrontations have drawn condemnation from politicians, who regard them as harassment, and have even reached the national headlines on occasion, such as when Dublin Says No activist Derek Byrne called President Michael D. Higgins a “midget parasite”. Byrne says their politics are “left-wing” but contrasts them with the Socialist Party and Socialist Workers’ Party, who he says preach “revolution” but “when they get to the streets it’s a case of turn up, have a few speeches and go home”. Despite this Dublin Says No been drawn into co-operation with political parties and trade unions such as Unite and Mandate through the umbrella Right2Water campaign, and this will include backing for its march in Dublin city centre on June 20th. Communities Against Water Charges describes itself as a “loose network of activists based in Dublin North-East”. It emerged after the area became a heartland of the resistance to water meter installations in mid-to-late 2014. The anti-metering campaign in the area began when Raheny resident Donna Thompson blocked Irish Water from an installation in May. She put out a call on Facebook which was responded to by activists from Dublin Says No and Edenmore. Later in the summer, when Irish Water tried to install in Edenmore itself, the activist base was already built up to resist them. Residents from Dublin North-East continued to prevent water meter installations throughout the summer, at first organising to stop Irish Water vans by standing in front of them, but escalating to sophisticated operations involving cars of activists driving around suburbs blocking off access from main roads. Inglis points out that some of the skills involved in these activities were picked up from the Greyhound strike earlier in the year when local activists, unaffiliated with the trade union SIPTU, blocked scab drivers from making collections in Dublin North-East in support of locked-out workers. As the campaign continued into September there were significant increases in Garda presence in the area. This resulted in more confrontations with local activists, filmed and circulated widely on Facebook, and protests against “heavy-handed” tactics outside Coolock Garda station. Taking advice from Dr. Paul O’Connell, now lecturing in law at the University of SOAS in London but originally from Dublin’s North-East, a group of local activists convened a meeting in Kilbarrack in November to form Communities Against Water Charges (CAWC). The core group of activists who keep CAWC going is small – probably between ten and twelve locals. But their reach is significant, holding weekly meetings in different suburbs around the area. Like many of Ireland’s grassroots anti-austerity organisations it has few structures, there are no members or committees, only a code of conduct. They aim to ensure “everyone who wants to has a say” in the anti-water charge campaign, something they feel can be stifled by more bureaucratic organisations like political parties and trade unions. Most of CAWC’s activists and those who come to their meetings are new to politics. Some like Gerry Kennerk, a former official with the builders’ union BATU, and Dublin Says No’s Bernie Hughes, a long-time left-wing activist, have previous campaign experience but most are picking up their skills for the first time. 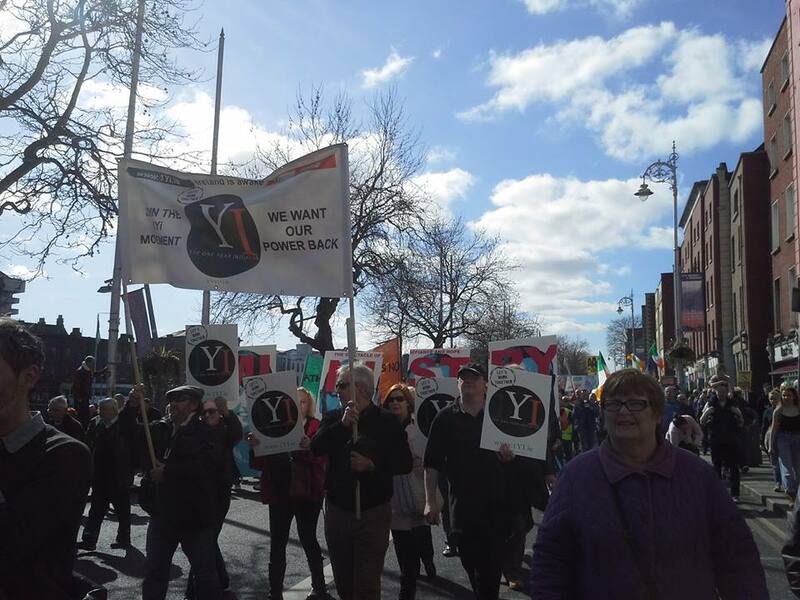 Despite their scepticism about political parties, and the general anti-political sentiment prevalent in many of the newer grassroots anti-austerity organisations, Communities Against Water Charges place themselves firmly on the Left, with Inglis saying the group’s politics are “socialist”. The One Year Initiative, known as 1Yi, is a campaign to have people’s-initiated referendums inserted into the Irish constitution. Its founder is Mark McAuley, a small businessman and former bank employee originally from Belfast but now living in the Republic. McAuley became interested in politics at the time of the anti-property tax campaign when his family was beginning to feel the pinch of austerity measures. At that stage, he said, he began to “examine things for himself to see what was going so wrong” in Irish society. Having never been involved in politics before, or even discussing it with any regularity with his family and friends, he attended his first protest on October 11th 2014, the major Right2Water demonstration. Expecting to see “a few hundred demonstrators” he was “blown away” by the numbers that turned out and “inspired” to get more involved in activism. After involvement in the water charges campaign for a number of months he drew up a document supporting people’s initiated referendums in January and began to solicit support for a campaign. From this the One Year Initiative formed under the slogan “we want our power back”. The group gave it this name because it is seeking a commitment to introduce an amendment to the constitution allowing for people’s-initiated referendums within a year of the general election. The campaign has a website at www.1yi.ie which allows people to sign up to become supporters, to keep informed about the progress of the campaign, or campaigners. The latter category join an internal Facebook group which discusses how to move 1Yi forward. By the time of the election they plan to have a campaigner in each constituency signing candidates up to a pledge to back people’s initiated referendums. 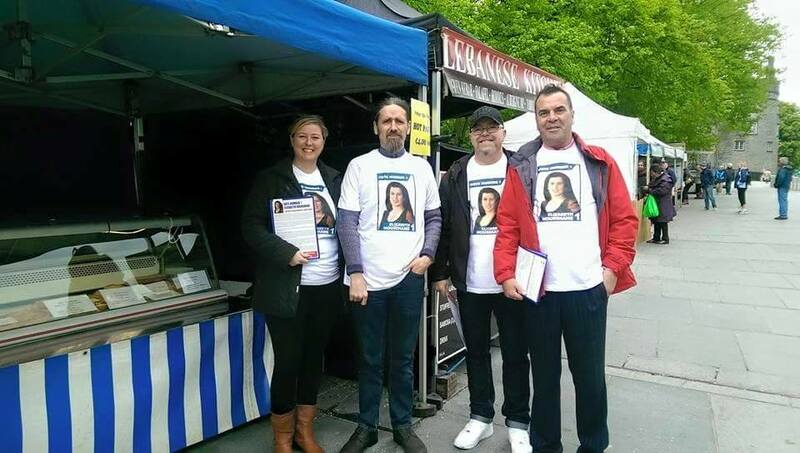 Already the group have secured the backing of independent, left-wing TDs Clare Daly, Joan Collins and Mick Wallace. McAuley describes 1Yi as a “non-political” organisation, who would accept support from anyone willing to endorse the initiative. However, he says they are examining the radical democratic experiments in Greece and Spain which have had successes in recent months and are seeking in both cases to introduce people’s referendums. He acknowledges that critics worry about such referendums falling victim to “populist politics” or scapegoating of vulnerable groups but says the aim is to facilitate such referendums within the context of existing laws guaranteeing human rights, and allowing for the input of “experts” in the various fields into the drafting of amendments. 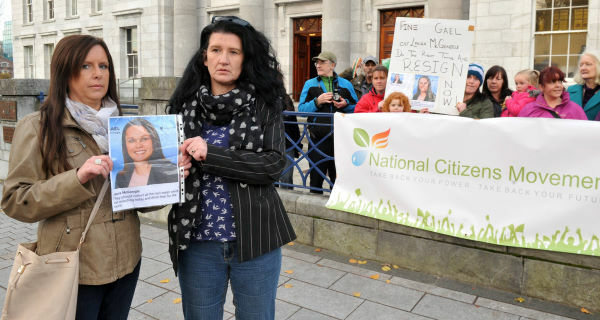 The National Citizens Movement launched in August 2014 as an attempt to bring together ‘Says No’ and anti-water charge groups from across the country. Its first meeting in Cork drew over one hundred activists and agreed to focus on “fighting Irish Water in the courts and getting accountability from the government”. Its leading figures are Dermot Murphy, who had previously been active with Direct Democracy Ireland, Elizabeth Hourihane, who stood as an independent in Cork in the local elections, and Alan Lawes, who was a member of People Before Profit. These are the admins of its popular Facebook page, which has over 25,000 likes. Two of them, Murphy and Hourihane, have cases pending in the courts against Irish Water. Murphy’s case is about the safety of the water meters that are being installed around the country. He believes that the Class C boxes which hold the meters are sub-standard, won’t hold the weight of cars crossing them and can be tampered with to interfere with residents’ water supplies. His case follows a similar one by Tony Rochford, who went on hunger strike against the property tax in 2013, and managed to have his box replaced with a more secure Class B box after court proceedings. The National Citizens Movement, which has its roots outside Dublin, rejects the water charges and property tax, and also campaigns for a people’s right to a referendum, supporting a reintroduction of Articles 27 and 28 of the Free State constitution, which provided for direct democracy. Murphy says it is also a “strongly nationalist” movement. They support an immediate referendum on membership of the European Union, renationalisation of Ireland’s natural resources and former state enterprises, and a “restoration” of the 1937 constitution. “I think a lot of people in this country just don’t feel it’s Ireland anymore, it feels like we’re run by Germany,” he says. This nationalist line has attracted criticism from left-wing activists who have accused it of being xenophobic or racist. Hourihane was on the record during the local elections as having fears that the Irish would “become a minority in their own country” because of immigration, and published a statement on the National Citizens Movement page calling for curbs to the number of migrants. The National Citizens Movement plans to run candidates in as many constituencies as it can in the general election, with an AGM to be held soon to move the project forward. It recently stood in the Carlow-Kilkenny by-election but, despite the support of MEP Luke ‘Ming’ Flanagan, it received only 250 first preferences, a tenth of the amount achieved by both People Before Profit and the Anti-Austerity Alliance. Murphy says the group aren’t so much disappointed in this result as “in the people who voted back in a Fianna Fáil politician” and that it wouldn’t deter them from standing in a general election campaign. The development of autonomous, self-organised organisations on a small-scale across Ireland is a new political phenomenon, of which the above-named are only a glimpse. To get a sense of the breadth of the groups now organising, type “says no” or “against water charges” into Facebook – hundreds of results return from towns across the country. There is little doubt that their existence stems from a rejection of the existing forms of representation. Those interviewed express a belief that not just the government, but the political system and in many cases the state itself is illegitimate: corrupt, captured by elite interests and in need of radical overhaul. But they also articulate the incapacity of the traditional institutions of opposition to respond to new ways of communicating and organising which are emerging organically from those at the front line of resistance to austerity in Ireland. The new community groups have given thousands of people, predominantly from less well-off segments of society, an avenue of expression on their own terms in a public sphere which had previously excluded them. They have also, through the collaborations necessary to build and sustain the water charges movement, significantly broadened the audience for anti-establishment politics. But, as the water charges campaign enters its second summer, will we see limitations in the atomised and structureless nature of these groups? Can such movements be sustained in the absence of a more robust political theory? Could they slip into right-wing populism? It’s not yet clear whether Irish politics is on a course of permanent fragmentation or whether realignments are around the corner which produce broader coalitions of opposition to the established order. Whatever the case, hundreds of small groups around Ireland are engaged in networked, daily resistance to austerity. They communicate through channels on social media that are almost completely missed by the mainstream press. Increasingly, they manage impressive feats of organisation. A significant proportion of those involved will not be bought off by public sector pay increases, income tax cuts or GDP growth figures. When the political class realises this it will have to confront a reality it has largely been denying: disillusionment in the Ireland they have created runs deep. Ronan Burtenshaw is a columnist with Village Magazine. Previous article Arising from Ashers. Next article A literary fascism.